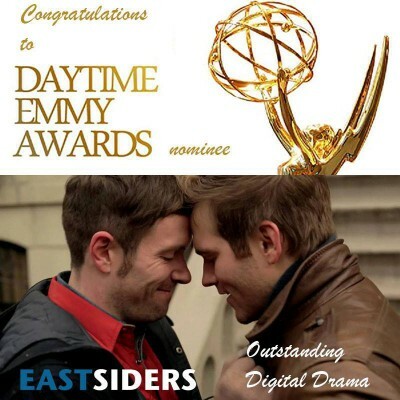 EastSiders Nominated for 2 Daytime Emmy Awards! The National Academy of Television Arts and Sciences has announced nominations for the 43rd Annual Daytime Emmy Awards and EastSiders: The Series was included in the Outstanding Daytime Digital Drama Series category. Called “Funny and Heartbreaking” by Entertainment Weekly, the critically-acclaimed LGBT series premiered its first season on Logo in 2012 and was subsequently picked up for DVD and VOD distribution by Wolfe Video. A second season premiered with an exclusive distribution window on Vimeo On Demand last fall after the production raised $153,000 on Kickstarter. Other entries in the category include East Los High, The Bay: The Series, Vanity, and Winterthorne. EastSiders also received a nomination for Outstanding Actor in a Digital Daytime Drama Series for Van Hansis’s performance. This marks Hansis’ fourth Daytime Emmy nomination, having been nominated three times before for playing the role of Luke Snyder on As The World Turns, who made history with daytime television’s first kiss between two men in 2007. Series creator Kit Williamson, who is also known for playing the role of Ed Gifford on the final two seasons of Mad Men, says ”I think it’s amazing that The Daytime Emmy Awards are recognizing digital series. There are so many amazing stories being told online and it’s incredible to see how high the bar has been raised in the last few years.” The series is also currently nominated for ten Indie Series Awards, including Best Drama, Best Writing, Best Ensemble, Best Actor (Van Hansis, Kit Williamson), Best Actress (Brianna Brown), Best Supporting Actor (Stephen Guarino), Best Guest Actress (Constance Wu) and Best Editing. Past accolades include an Indie Series Award for Best Ensemble, an LA Weekly Web Award for Best Drama and a Satellite Award Nomination from The International Press Academy. First announced on The Talk, the full list of nominees has since been reported on by Variety, The Hollywood Reporter, Deadline and dozens of other outlets.